42 years old; Married, two kids; Typically works 60 hours/week. Sharon is a primary care physician who works in a small satellite practice that is part of a large integrated delivery system. She gets a lot of personal satisfaction from having long-term relationships with her patients, who appreciate the personalized care she provides. She spent 11 years in higher education and remains in debt to this day. Sharon often feels that when practicing medicine, she is working for the technology instead of the other way around. She is often frustrated by how many complex documents need to be created to maximize billing, despite the fact that the same information must be displayed in a way that is relevant and clear when used to work up a patient. Sharon comfortably uses consumer technology in all aspects of her life. Be able to efficiently and easily share information about my patients with other providers. Be able to spend less time completing administrative or duplicative tasks that get in the way of patient care, including delegating some of these tasks to practice staff. Be able to communicate effectively with patients by providing information and directions that they can understand. Continue to make the necessary income needed to pay educational debt and support family. Achieve a better work-life balance so that more time can be spent on non-work-related activities. Consistently provide high-quality care for patients, see improvements in their outcomes, and help them stay healthy. Identify new revenue opportunities at the practice so that the business can grow and become more financially stable. 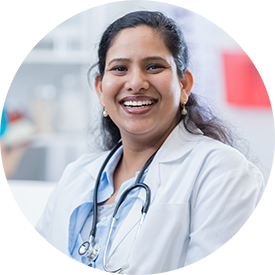 Identify and participate in an advanced care team solution so that the practice can improve its management of patients with multiple chronic conditions. Identify more ways that technology can be used in the practice to save time or improve processes, workflows and tasks. Become a totally paperless medical practice in the next two years. Spend 2–4 hours every day after work completing EHR tasks, which results in less time for continuing education, family and other non-work-related activities. The practice cannot keep exam rooms full, because medical assistants must take time after each visit to complete the post-visit quality reporting tasks required for each patient. Incoming CCDA care summaries that contain 30 pages of information and only one paragraph of clinically relevant data that the EHR cannot find. Alerts are helpful... until they are not. Alert fatigue is real! Trying to document information in the EHR during the patient visit, while struggling to find the correct place in the EHR to document the information for quality reporting, distracts from interacting and communicating with patients effectively. Prior authorization and other payer-imposed roadblocks contribute to inefficient care delivery for both clinicians and patients. Patients with multiple chronic conditions can be very difficult to care for. They require frequent communications with practice staff, have complex needs due to being on multiple medications and treatments, and often are seeing 1–2 additional specialists. Anything that can make caring for these patients more effective and efficient would be helpful.